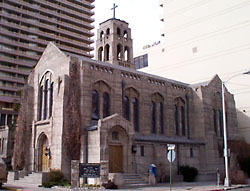 The First United Methodist Church is one of the oldest remaining churches in Reno. It was built in 1925 and designed by Wythe, Blaine and Olson, a firm based in Oakland, California. The Period Revival cathedral displays impressive Gothic Revival design elements, utilizing a cross plan, typical of that style. 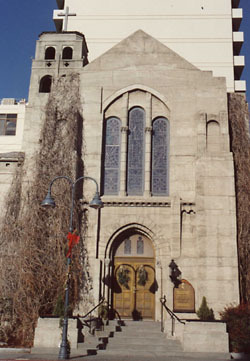 The three-story cathedral was one of the first poured-concrete buildings in Reno. The wood grain left by the planks used as molds for the exterior can be seen in the concrete. The rough surface was left to facilitate the attachment of vines to the walls, but for unknown reasons, these vines did not grow. The church's scale combined with its siting on a corner near the river is dramatic and impressive, making it appear even larger than it is. The parish house and connecting wing were added around 1940, and were designed by prominent local architect, Edward Parsons. The Methodist Church congregation was established early in Reno's history in 1868, organized by Reverend Thomas McGrath. The First United Methodist Church, the third Methodist Church to be built in Reno, was constructed during a time when Reno had an international reputation for the migratory trade, which resulted in negative publicity for the town and the frequent comparison to Sodom and Gomorra. In an attempt to defend the decency of the permanent residents, Reno was portrayed as a town of church-goers. Several new churches were built during this period. The First United Methodist Church is located at 201 West First St. in Reno and is open to the public.